You must make reservations at least 5 minutes in advance of the time at American Kitchen. Accessible by Lafayette Bart station and County Connection bus system. Casual comfort food in s relaxed and inviting setting, that's what American Kitchen is all about. Whether it's our famous Bottomless Mimosa weekend brunches, sharing appetizers and pints of beer on our patio, or enjoying breakfast, lunch, or dinner with friends and family, we focus on bringing you classic American cuisine, fresh local ingredients, local artisan coffee, craft beers, and great California wines. Nestled in the heart of downtown Lafayette, we invite you to step out of your comfort zone, and try what everyone has been talking about. With fantastic reviews from Diablo Magazine and other local foodie news outlets, American Kitchen has quickly become the new go-to place in Lamorinda. And with the largest and most inviting patio in the area, there is no better place to enjoy California outdoor dining. Cheers! It was our family’s first time going. We were created by name at door and promptly seated. Food and great and service prompt and attentive. My son said shrimp Po boy was just as good as the ones from Louisiana. I would highly suggest this place for a family dinner. Price was on point as well no issues from us. Cute place in downtown Lafayette that my husband and I went to on Friday night. We had their mac and cheese and eggs Benedict, both of which were tasty. We won't go back, however, due to the large number of screaming, out-of-control kids, running in and out of the restaurant, who were literally on top of the outside tables. Noise level was out of control; there was no way to have a conversation with each other. It's too bad, because it seemed like a good place to try for breakfast. I have a feeling that would be even worse than dinner. Excellent food, excellent service. It is child friendly and dog friendly. Inside the noise level is high so not good for the hard of hearing folks but it works well outside. Must try for anyone visiting Lafayette. A family owned restaurant with high quality food and service. Went to meet friends who we haven't seen in a while. I was pleasantly surprised to discover that they take reservations. Hardly anyone takes reservations anymore, which I think is a very greedy approach and certainly not "Guest First". Having managed several restaurants in the past, I get that and really appreciate that AK is more geared to the customer rather than the bank. That said, the food was great, the ambiance friendly and family like. Parking was easy, but we went pretty early on a Sunday. I would definitely recommend AK. American kitchen was a delightful brunch stop on a Saturday. Lots of families and a warm inviting atmosphere. The owner is so nice there. He made special accommodations for me and my stroller. The food is great, the staff is so friendly. I love this place more and more every time. We absolutely LOVE the breakfast here! Every time I am in town to visit my son at college I take a big group here for a weekend breakfast and it has NEVER disappointed! The French toast, Benedicts, pancakes are all amazing - and a simple egg dish is wonderful as well. Can’t go wrong here! Enjoyed the family friendly atmosphere. Service very mediocre. Same with the food. We enjoyed the nice staff and the meal was good but the noise overwhelmed the experience. We really like coming here for dinner ... very friendly and casual with delicious food! My spouse has enjoyed all kinds of dishes, but I can't stop eating the nachos! My current favorite dish is the shrimp nachos. Although it might not be readily apparent, they have many gluten free options. I should have known when there was no problem getting a reservation when other restaurants had nothing available. The server was pleasant. The setting was "cute" but crowded and noisy. And the food? Absolutely zip! I had French Toast. Four pieces of plain bread slapped down on a plate with some syrup splashed around like some little kid playing in a sandbox. I would have been embarrassed to have served it to my wife on a quick Saturday before I hurried off to play golf. And yes, looking around at my companions, things looked equally terrible. We were friends that had gathered from back East, Martinez and LA for a one-time meeting and were actively engaged in old times not food criticism but it was noted by all. This restaurant is riding on the fact that it is in Lafayette, a super hot dining area, but it strikes out completely. I never respond to these questionnaires but this experience really rang my bell. Always enjoy breakfast here. Omelets are solid. Sandwiches were dry! Meat tough. Food cold. Emailed restaurant but no response. Thanks for checking in. Very nice place for an afternoon lunch with a friend. Lots of good options, including breakfast food and salads and small plates. The service was attentive. The only downside at all is parking, so give yourself an extra few minutes to find a spot. Nice place to meet up with friends. Food and service were perfect. Enjoyed our dinner and wine. Loved the brownie dessert. We were a party of eight with two small children and we had a great experience. Good food, excellent service and they take reservations for brunch!! My friends plate that had food on it while my friend was biting into her toast. I hope they teach basic etiquette in the future. We had a party of 8, 4 kids, 4 adults. The “avocado toast” barely had any avocado and it was topped by lettuce instead to hide the fact they cheaped out on avocado. The kids didn’t eat their chicken fingers because they were overly cooked and when they polenta came it was cold and lumpy, the opposite of what the dish is supposed to be. The staff was pleasant but felt they didn’t want to be there and ask how the food was. OVERALL DO NOT GO! Unless you have really low food expectations. 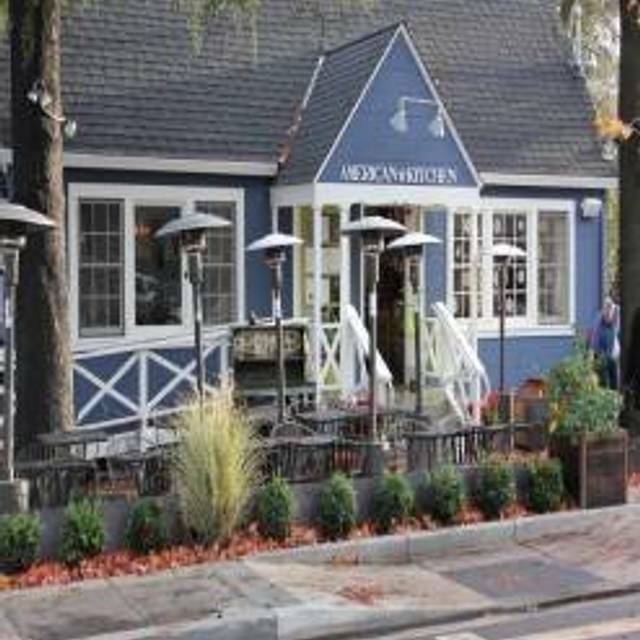 Cute neighborhood gem with amazing food! We are already planning our next trip to try the rest of the menu. The only disappointment was my chai- which tasted great but was served in a tiny mug which was more than half foam. Not worth the price- wouldn’t order it again in the future. We will definitely be back for the food though! Best bacon eggs Benedict I’ve ever had on top of crispy polenta- amazing!!! A nice casual restaurant with some decent breakfast and lunch options (don't know about dinner menu). Staff was very friendly and service was quite able. Food portions were good and tasted fine. Restaurant outdoors and indoors were a little too "natural" for my tastes--would be nice to see a real outdoor patio, not a dirt one and some of the furniture inside the place could be upgraded. Great service, the salad was brilliant and the added chicken was perfect. Might need to brush up on their coffee skills but it was fine. We waited more than an hour for our food and one person in our party never received their meal. This is the first time in my life I didn’t leave a tip. We love sitting outside and bottomless mimosas but the service is really slow. The food is decent. My eggs Benedict were over done. Yolk hard. The French toast was good. Breakfast burrito decent. We frequent America’s Kitchen regularly. Food always interesting and great! Service too. Fun, low key, place to enjoy a meal out! They were super friendly and hospitable for our table of 11 17 year old girls for a party. Let me come early and decorated, kept the cup cakes safe until it was time- made everything really easy and the kids loved it! We were there around 5PM, only two other tables occupied from what we could tell. Slow to get served and served a drink. Specifically told the gentleman that we didn’t like onions. When food was served, I had a vegetable dish that was a third onions and my wife’s dish also had onions. The gentleman, who seemed to be the manager, said he thought we didn’t want parsley. Huh? They did provide me an alternate vegetable so I’ll give them credit for that. But the main meal was also lukewarm. Given the ratings, pretty surprising. Maybe just an off day/time? Poor quality food. Service was not interested in our interests for what we wanted. No substitutions. Bagel may as well have been wonder bread. Eggs Benedict was served with a mediocre avocado and nice fruit in a very chipped ramekin. Food wasn’t very hot. I had a reservation for 10 people for my moms birthday and over an hour before the reservation Victor called and left 3 voicemails demanding that I call ASAP about my reservation. Which I had also confirmed the day before. When we arrived 10 mins early Victor said your reservation is not until 11am so we will seat you then, even though the table was set up and ready. The coffee was the worst tasting coffee I have had, horrible. We waited over 1 hour for our food which was served cold. We were also never told that our food was coming or were checked on. I understand it’s a larger party, but if your kitchen or staff can’t handle a larger party with your normal business don’t allow for reservations or at the very least give the customers a heads up. We will not be returning to this restaurant. Really fun brunch with great choices. Service was terrific and super friendly. The outdoor patio is the best! Very friendly and a relaxing vibe - great for families.